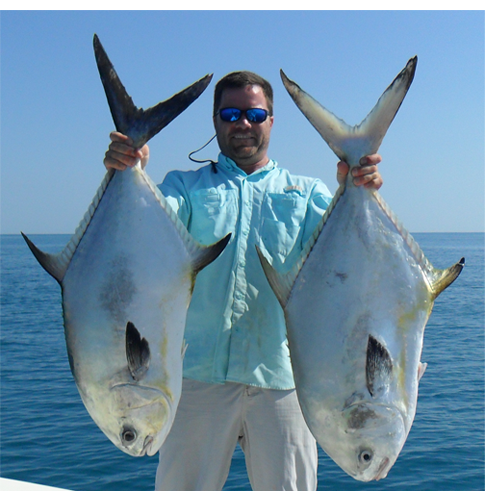 The reefs off the beaches of Tampa Bay are world renown for it tremendous Permit fishery. Often Permit schools have thousands of fish in them. Larger Permit in the area can reach up to 50 pounds; without a question the world record could fall in these waters any day. Along with the exciting prospects for Permit, the Bay is loaded with their small cousin the Pompano. Pompano average 2 to 5 pounds and occasionally go over 6 pounds. They hang out in a variety of areas throughout the Bay depending on the time of year. They can be found on shallow grass flats, all the beach ( reef areas???) and around deep water Bay area structures. Pompano are a lot of fun to catch on light tackle and fly rods and are great to eat.